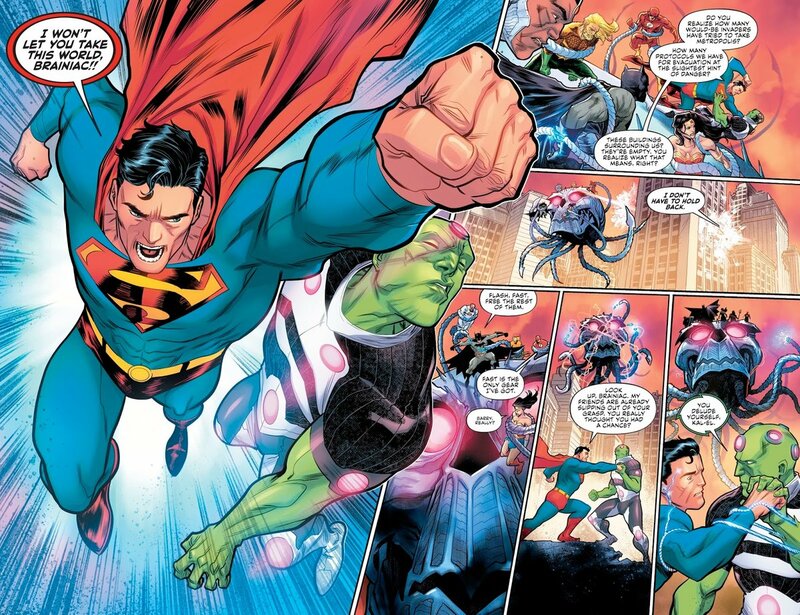 THE SCENE: In a battle between Brainiac and the Justice League, Superman lands a high-impact blow. But Brainiac’s motivations aren’t what the Man of Steel thinks they are. WHY THEY’RE AWESOME: One thing I’ve always remembered about Superman Returns is the critique about its action sequences. Specifically, the notion that we needed to see Superman punch somebody. I don’t necessarily agree with that. However, it is always satisfying when Big Blue hits a big blow on a big bad. Case in point, this moment with Brainiac. What makes these two pages truly awesome the layout. Francis Manapul makes the punch as giant and epic as it deserves to be, complete with a heroic one-liner and Superman’s fist coming straight up at us. But then you’ve got the figures overlapping just a bit with the panels on the opposite page. More often than not, that trick makes for a really fun visual. I also really like the sequential storytelling here. On the previous page we see Brainiac on top of his ship, with the rest of the League wrapped up in those tentacles. Then we get the punch, and in the next two panels we follow them off the ship and through that building. And based on how that lower middle panel is framed, we can see what kind of distance they’ve covered in relation to the ship. Finally, that lower right panel gives us a really nice pull into the next page. Not only do you have that defiant line from Brainiac, but he’s blocking another punch. Thus indicating the momentum is about to shift. Justice League: No Justice wraps up today with issue #4. As I’ve said previously, this is the first Justice League story I’ve picked up in a couple of years. Very curious to see where this goes. This entry was posted in Comic Books/Graphic Novels, Panels of Awesomeness and tagged Brainiac, comic book reviews, DC Comics, Francis Manapul, Hi-Fi, James Tynion IV, Joshua Williamson, Justice League, Justice League: No Justice, Justice League: No Justice #1 (2018), Panels of Awesomeness, Rob Siebert, Scott Snyder, single issue reviews, Superman, Superman Returns (2006) on 05/30/2018 by primaryignition.